I went shopping yesterday with some friends from high school (J, B, A and S). We walked around a lot and our first stop (after the train ride) was to my utmost favourite fabric and notions shop. It’s a great place, they have a lot of basement bargain pricing for a lot of their things and I always have a blast there. The catch is that they only take cash or debit. Thank goodness for my debit card, but I didn’t spend that much anyways! Mini-fabric store haul. 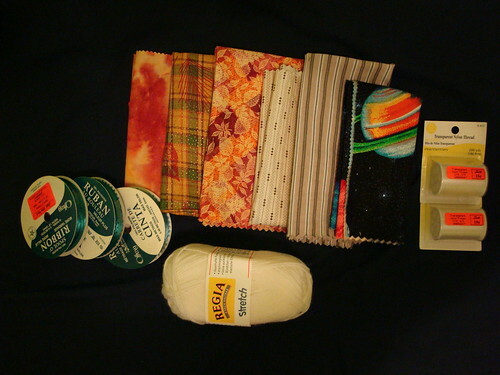 I got 3 spools of ribbon ($0.25/each), 6 fabric remnants that are between half and a quarter of a fat quarter size ($0.25/each), 2 spools of Coast Transparent Nylon thread ($0.25 each) and 1 ball of Regia Stretch sock yarn ($1.99, 50g). I was really impressed that I could find that many fabrics I liked out of their remnants bins (it’s the only places I generally dig through, I buy fabric for sewing doll clothes and I never need up to a whole fat quarter as I don’t want to make six of the same dress in the same fabric, nor do I sell the dresses that I make, so that’s a-okay with me!). Total cost was under $6, after tax. 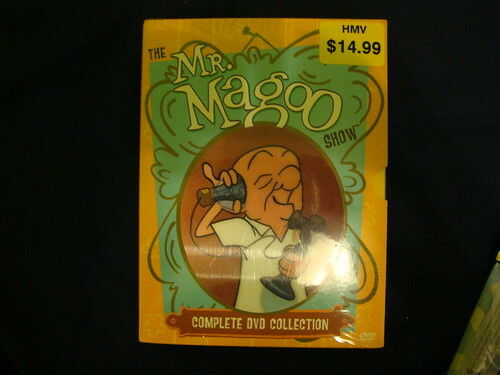 The complete DVD collection of The Mr. Magoo Show from HMV for $14.99. I used to watch this sometimes on tv when I was younger and was surprised that it was out on dvd since it is so old (my older sisters recognized it, but they never really watched it, I don’t remember when I watched it, but it was sometime in the early 90s). All the episodes and includes a reprint of a comic book, yay. One of my favourite stops was this great used bookstore that sold books in English, Japanese, I also believe Chinese and maybe Korean? 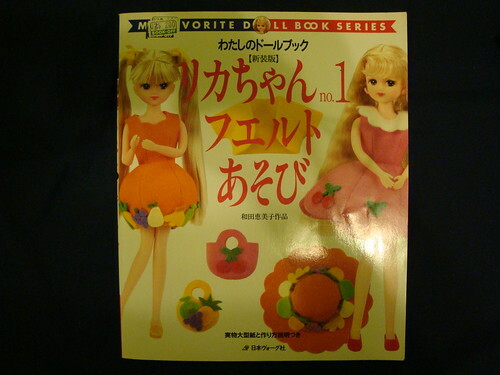 Anyways, I somehow managed to find the craft section in the Japanese magazine aisle and found the only doll clothes sewing book available. Bonus was that all the clothing is for Licca dolls and that’s a bonus because Blythe happens to be the same body size as Licca (despite having a much larger head). I was pretty excited to find this for $2.00. I went to volunteering for the first time in a while. I missed last week and the week before. I lost my voice one weekend and I had a mild fever the other weekend and because I volunteer with generally much older people who have weakened/poor immune systems, I always stay home when I’m even remotely sick as I don’t want to chance getting them sick. But I went in today, as I was feeling great, and had a wonderful time (despite the fact that I attend “church service” and literally know none of the words, or the tunes, or anything like that) and helped out and got a lot of smiles. How has your weekend looked like so far? What’s something fun that you did? Suh neat finds! I really dig the space fabric you found. Reminds me of a mattress I had when I was little.. instead of being plain white or whatever, it has space stuff all over it! Good thing about you not volunteering when you’re sick.. wouldn’t want to get anyone else ill, and like you said, their immune systems are weak. My weekend was alright I guess. Fri-Sat I was a zombie because I was so sleepy! Didnt have to work yesterday so I caught up on some sleep. Today I am still really tired but Im gettting ready to go to work. I’ve not heard of Mr Magoo! D: There are so many old television shows that I used to watch. I only come across a few snips on YouTube, never spotted any in a store. I’m partial to remnant bins because I only sew doll clothes – they never require too much fabric (which is awesome!). Wow, such great deals on all that stuff you bought. I remember Mr. Magoo! Man, that’s old times. I have some Looney Toons on DVD which I love. Old cartoons never get old and new cartoons have nothing on the old ones, you know? I love HMV. Such a great store. I never buy anything due to having no money, but there are a lot of great things in that store that I’d like to own. I loved Mr. Magoo when I was younger, although now as I rewatch it, I realize how racist it is with the Asian characters (I didn’t realize it was racist when I was younger, mostly because I wasn’t aware of stereotypes like that). Now the weekend was only ..three days ago.. and I am having problems remembering lol. I do think we went to davids dads saturday, and i stayed home sunday and didn’t do very much!